Here’s a nice video about UK based framebuilder Robin Mather. I’m proud to say that Robin uses BikeCAD Pro. The program makes a brief cameo at 2:08. 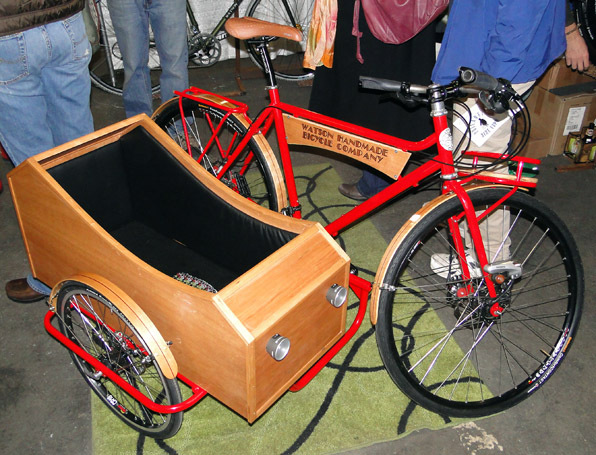 The Philly Bike Expo is a small regional bicycle show organized by Bina Bilenky, daughter of Stephen Bilenky of Bilenky Cycle Works. After missing last year’s inaugural show, I was happy when the opportunity to visit the city of brotherly love presented itself this year. As expected, there were lots of Bilenky bikes around. 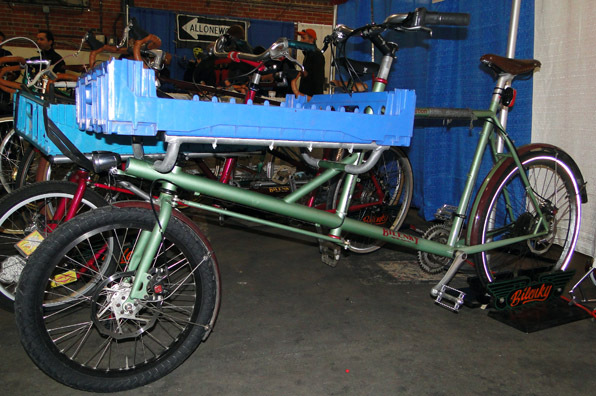 I really like their cargo bikes seen below. 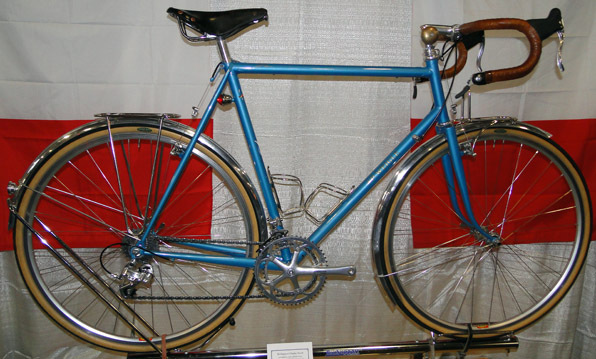 Below is the Columbus MS track bike by Chris Bishop that won Best Steel Bike at the 2011 NAHBS. 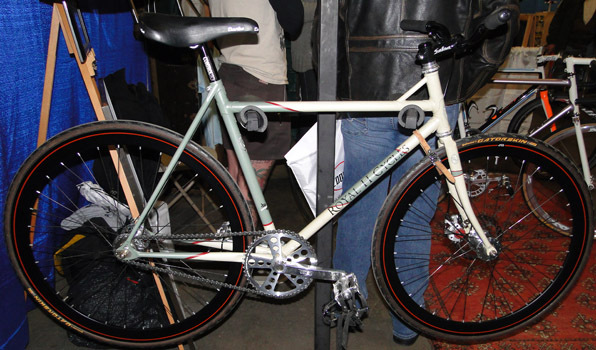 Unlike NAHBS, the Philly show was not concerned with awards. However, that didn’t seem to make the exhibitors any less busy. I never actually got a chance to say Hello to Chris this time, so swamped was he talking to other show visitors. 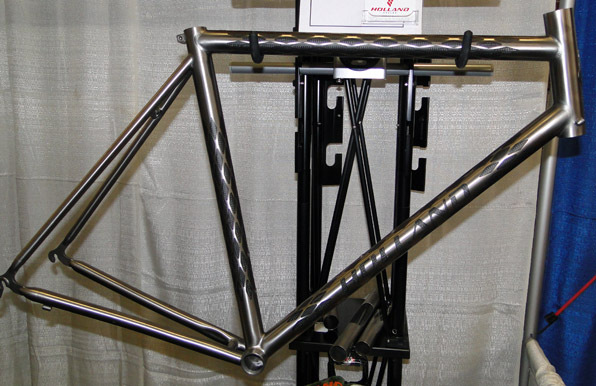 Chris Igleheart had a number of nice bikes with him including this frame which can separate into two pieces thanks to the Ritchey Break-Away system. It was nice to talk to Chris Bull from Circle A Cycles. 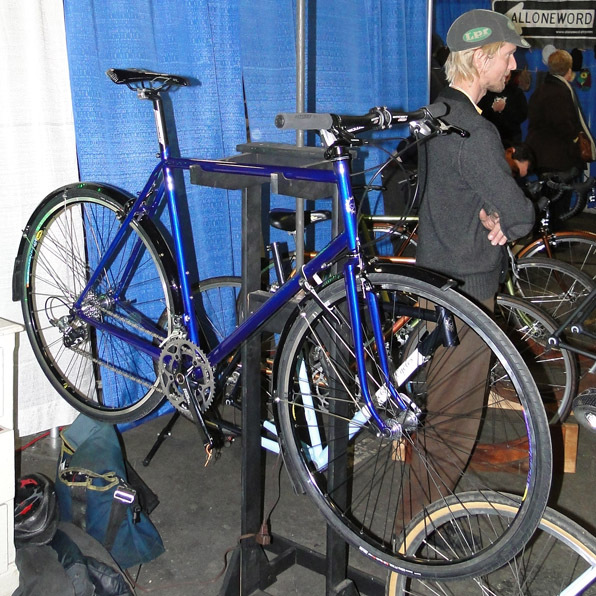 Chris’s business collaborator, Brian Chapman can be seen in the background of the photo below exhibiting bikes under his own name. Apparently, my name has been somewhat burned into the minds of Chris and Brian as they read it each time they launch BikeCAD Pro. My name comes up in the credits for providing the American English for the program. It may be a little known fact that BikeCAD displays different spellings for words like color, colour, tire and tyre depending on whether you’re American, Canadian, or British. Of course, it will also display words like bicicleta, fiets or fahrrad if your language of choice is not English. More on that here. 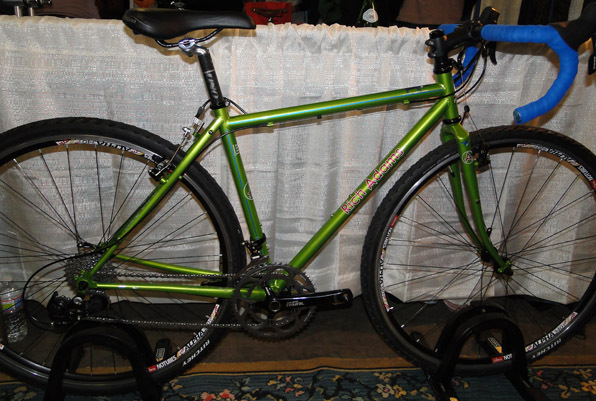 Below is one of the bikes brought by Hubert d’Autremont of Cycles d’Autremont from Burlington, Vermont. 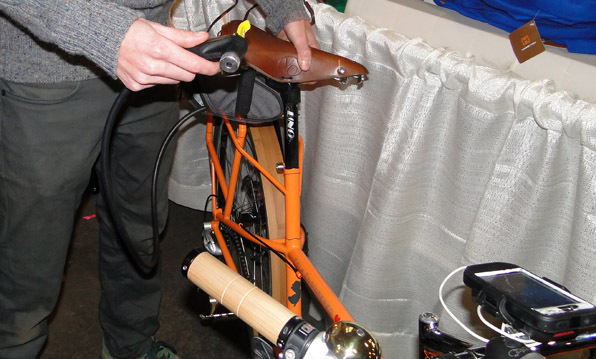 Hubert also had his bike from the Oregon Manifest featuring, among other things, a rubber sleeved cable lock that retracts from the handlebar. Alas, that photo didn’t turn out. I enjoyed talking with Ryan Reedell and Marie Pasquariello from Folk Engineered. 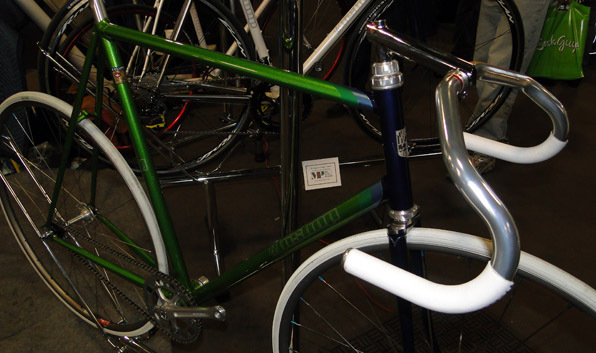 They had some samples of their production bike, the Marsupial on hand. 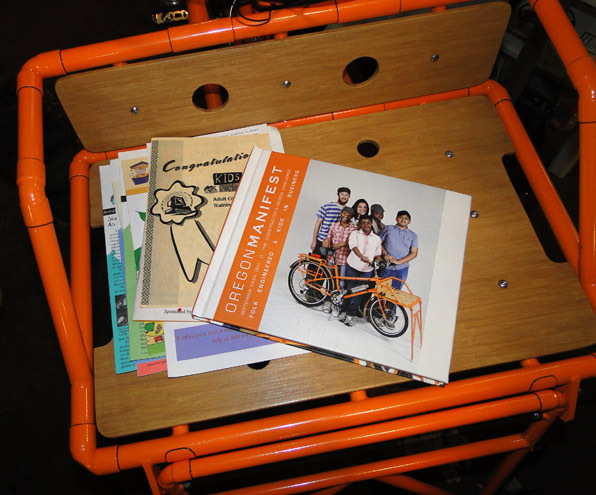 They also had the bike they designed with 4th-8th grade students from the Discovery Charter School for the Oregon Manifest. 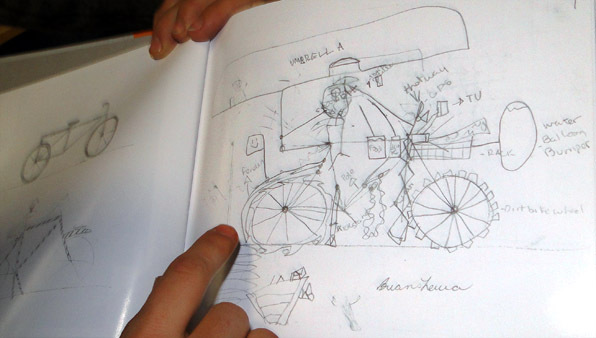 Looking through the book that documented the process, I was starting to wonder how many of the kid’s ideas could have possibly been incorporated into the finished bike. Features like a massive umbrella, a water balloon bumper and wings, while undoubtedly awesome, seemed like tricky things to implement in the real world. 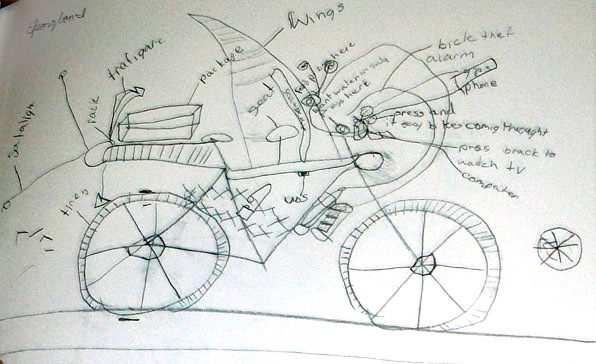 While the water balloons may have been left on the cutting room floor, Ryan and Marie were adamant that they could not have come up with many of the features of the finished bike without the collaboration with the kids. The tire pump which Ryan demonstrated by pumping the seatpost up and down was just one ingenious example. The bike also charges a smart phone and powers a headlight when in motion. 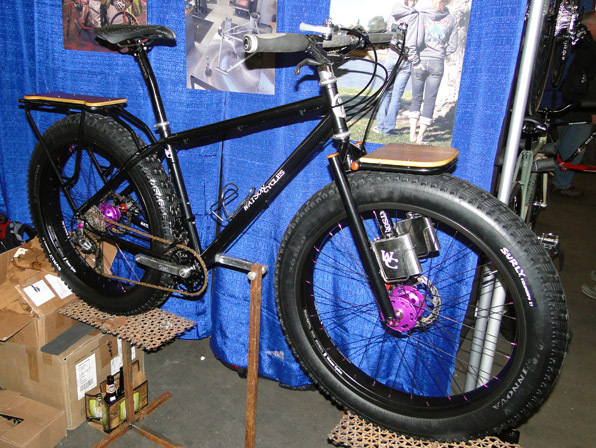 Holland Cycles came all the way from San Diego to exhibit their Exogrid Bicycle which looks absolutely amazing. Peter Weigle from Connecticut had a couple of bikes on display. They featured elegant features like integrated tail lights. 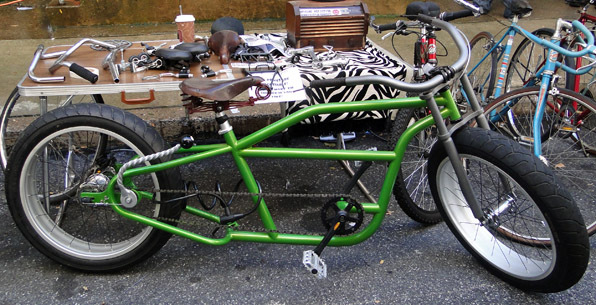 Rich Adams built the bike below for his wife. I really like the paint job which features a little cartoon bunny designed by his wife. Royal H was sharing a booth with Icarus. I managed to chat with Ian Sutton of Icarus but I did not get a photo of any of his bikes. 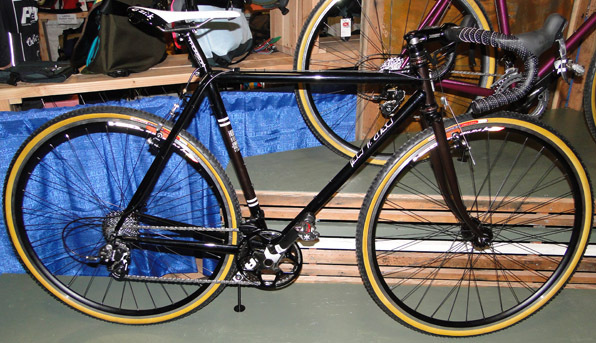 Meanwhile, I took this photo of Bryan Hollingsworth’s Royal H bike without having a chance to talk to him. Both Ian and Bryan make great bikes. I was super impressed with this bicycle equipped with dog carrying sidecar by Andrew Watson of Watson Cycles. Andrew also built this beast that looks like it could claw its way over just about anything. Out in the alley next to the show, there was a bike swap featuring some pretty neat bikes like this crazy chopper with a funky shifter in the rear for the internal gear hub. In the photo below, Chris and Brian are packing up for the drive back to Rhode Island. It was a long way for us to come down from Canada too, but we’re glad to have made the trip. It was a great show! You are currently browsing the Bicycle Forest Blog weblog archives for November, 2011.